Vantage is a part of the Muny Corporate Advantage Program (MCAP), which allows us to offer our members access to the lowest price for new Muny season tickets. 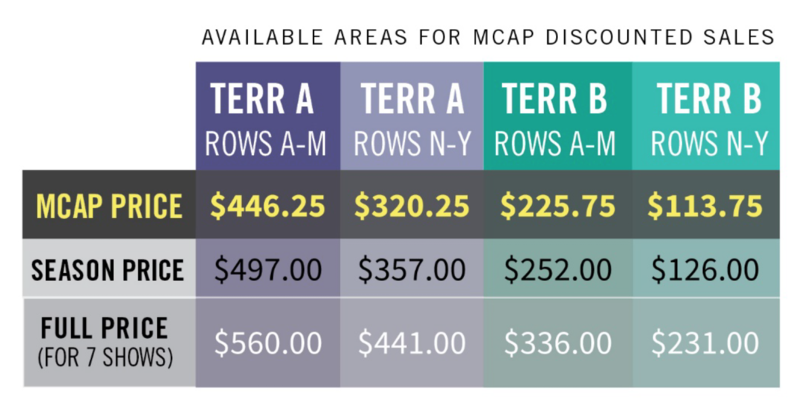 MCAP tickets will be available for purchase April 5 – May 5, 2019. Order online – click on “Buy Tickets,” or by phone (314.361.1900 ext. 550), or in person at the Muny box office (9am—5pm, Monday through Friday). Pay for your tickets by cash, check or credit card. Your tickets will be mailed to your home address at least one week before the season starts. * The MCAP discount is not retroactive to prior season ticket purchases or applicable to season ticket renewals.